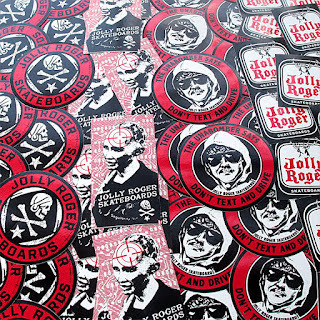 Jolly Roger Skateboards: Jolly Roger Stickers are Ready for Sticking! Jolly Roger Stickers are Ready for Sticking! You can order a sticker pack HERE. 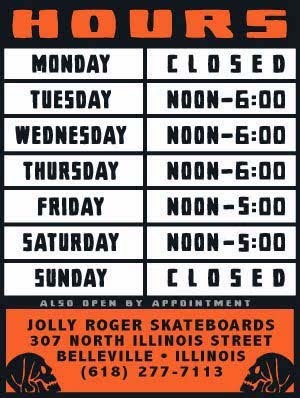 JOLLY ROGER SKATEBOARDS is a skater owned and operated shop located at 305 North Illinois Street in the city of Belleville, Illinois (about 5 blocks from the City Skatepark). We are more than your average skate shop. We design and print our own limited edition decks, apparel and "Guano" wheels. We were also the first to design a commercially available screen-printing platen for printing skateboards, the SKATE MATE. We also carry DERBY GEAR, such as: helmets, pads, mouth guards, wheels, bearings, toe stops, skates and more. If there is something that we don't have in stock we can order it for you. If you are coming from out of town and can't make it during our regular business hours, just give us a call at 618-277-7113 to schedule a time to come in and we will open up just for you. In addition to skateboards and roller derby gear we also offer: commercial screen-printing, heat transfer vinyl for apparel, custom widows decals and more.